Heat around 1 tbsp oil in a kadhai. Add mustard seeds and when they splutter, reduce the flame, add cumin, asafoetida and turmeric powder. Then add beans, stir, cover and cook on low-medium flame until they are tender. Uncover and stir occasionally. 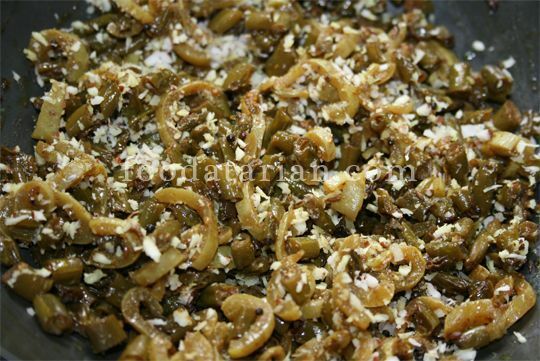 Add sliced snake gourd, cover and cook for 3-4 minutes or until gourd is cooked. Then add tamarind pulp, jaggery, goda masala, salt and mix well. Cover and cook for 2 minutes. Garnish with coriander leaves and fresh coconut. * If you do not have Maharashtrian Goda/Kala Masala, you can use garam masala. But I suggest you to stock this masala, it gives a unique taste to most of your vegetables and dals.